In the last few months, Noah and I have really gotten into a nice routine of reading more. We used to read before nap and bedtime, but I found he would often lose interest quickly because he was tired. Instead, we now read first thing in the morning after we eat breakfast. We also usually read a little bit more at some point in the afternoon. 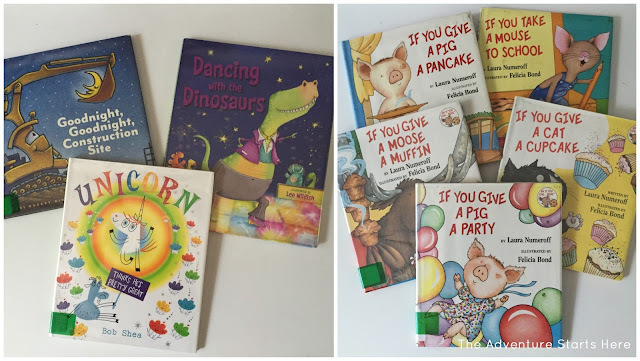 "Goodnight, Goodnight, Construction Site" | "Dancing with the Dinosaurs" | "Unicorn"
"If You Give a Pig a Pancake" | "If You Take a Mouse to School" | "If You Give a Moose a Muffin"
"If You Give a Cat a Cupcake" | "If You Give a Pig a Party"
From our library picks, we both really enjoyed "Goodnight, Goodnight, Construction Site". We own the sound version of the book, but I prefer the hardcover because it has more words in it (and the sounds can get annoying). I think we will be buying the hardcover version to add to our collection. "Dancing with the Dinosaurs" was pretty silly, we only read it once. I enjoyed "Unicorn" and thought it had a nice message. And we enjoy the "If You Give A" series, but not sure I'd buy too many for our own collection. In addition to checking out books from the library and reading books we already owned, Grandma took Noah (and me) to the bookstore and bought him way too many books! We were saying that we like to check books out from the library to see if we like them and then buy the ones we love to grow our collection. Also, there were quite a few books I was interested in that our library just didn't carry. Thank goodness for Grandma and her love of books... because books are not cheap! 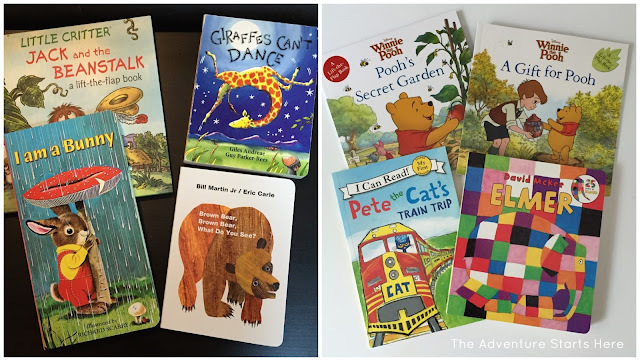 "Jack and the Beanstalk" | "Giraffes Can't Dance"
"I am a Bunny" | "Brown Bear, Brown Bear, What Do You See?" 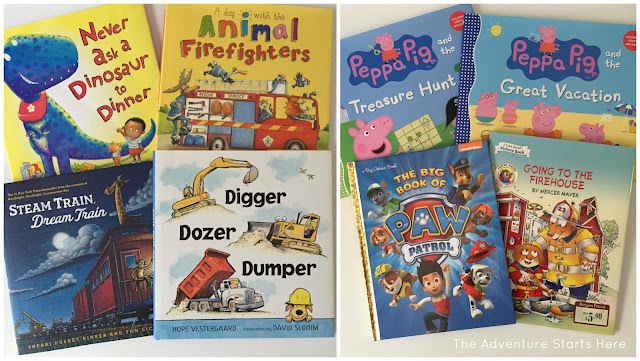 "Pooh's Secret Garden" | "A Gift for Pooh"
"Pete the Cat's Train Trip" | "Elmer"
"Never Ask a Dinosaur to Dinner" | "A Day with the Animal Firefighters"
"Steam Train, Dream Train" | "Digger, Dozer, Dumper"
"Peppa Pig and the Treasure Hunt" | "Peppa Pig and the Great Vacation"
"The Big Book of Paw Patrol" | "Going to the Firehouse"
While we've had the first four books for a while, Noah has found a new interest in many of them. I love reading "Giraffes Can't Dance", because not only is it a great book, but it was one of the first books I ever read to Noah as a baby! Any more suggestions of books we MUST read? You guys are reading machines! And you have some good suggestions! I think it's a good idea to read in the morning after breakfast. I wish I had time for that. 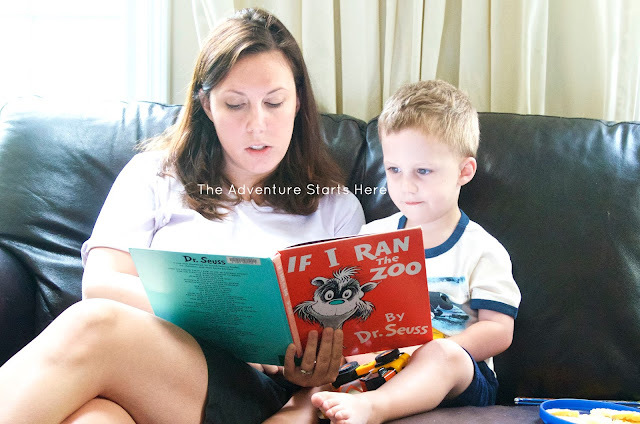 When we read before bed, often Mason is tired and I am tired and while I like the idea, I feel like we are both rushing through so we can go to bed and relax. No kidding books are not cheap! Its a shame too because actually holding a book in your hands to read is becoming quite rare these days; it seems to be a sad cycle. But on a happy note, how cute was that picture of a baby Noah?! What a great array of books you guys got! Giraffes Can't Dance is one of the first books I ever read to Mila! Very cute book! I was actually looking at Steam Train, Dream Train not too long ago - I'll have to check that out. So many great books! Steam Train Dream Train and Giraffes Can't Dance are some of our favorites too! I hate the "If You Give A" book series, but Mac likes. I've heard good things about the Pete the Cat books. We need to check some of those out. 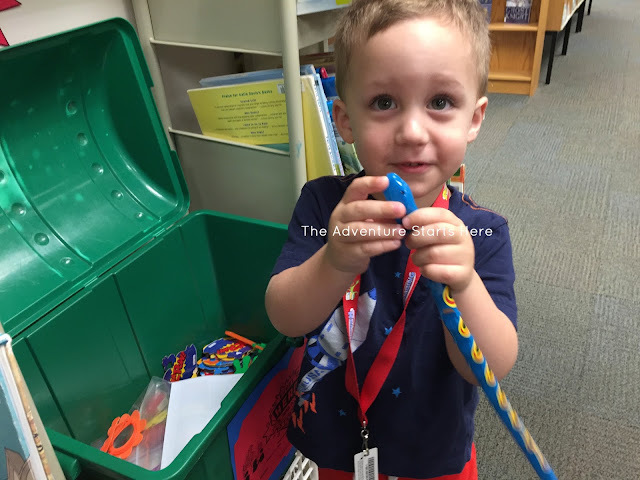 How fun that your library offers a summer reading challenge! My mom taught me to love reading and it's definitely something I want to pass on to my kids one day. That first book sure holds a special place! I love the first books Aria had as a baby but I love the first book she showed any interest in the most - that Halloween book 5 Little Pumpkins. So nice to add so many books to your reading collection too, those definitely add up. I have a huge amazon list of books we'd like to add to Aria's collection.